Welcome to the first FitDog Friday of 2014! Wow! We can't believe how fast the year flew by. In 2013, Rocco grew from a baby pup to a beautiful and healthy young dog. Now, at 15 months, he's in full-mode agility training and we hope to compete in our first trial this spring. He's so much fun to run with. And, for anyone who's thinking of starting up agility this year, I want to give you just one bit of advice... remember, it's all about having fun with your pup! 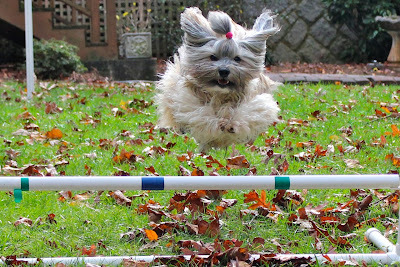 Keep it fun and both you and your dog will enjoy agility whether you have aspirations to compete or are enjoying a weekly agility class. Our Fit Dog goals for 2014 include mastering the weave poles and ensuring that Rocco has the focus and maturity to stay with me in a competition setting. Then, if he's ready, we'll look for some trials in the springtime. Learning the weave poles... we're using the 2 x 2 method. We'll talk more about that in a future post. Our goals also include more fitness for me... so I can keep up with Rocco! I'd like to add more cardio, strength training and flexibility to my fitness routine. Rocco's in great shape, but I find I have to add in some human-only workout time, too. So boring, I know, but even though I'll still use dog activities for some of my fitness, I find that using Rocco as a hand weight just isn't quite doing it for me! ha! Having said that, here's one quick tip the get the most human fitness benefit out of agility training. When you are walking the course, run it instead. Sure, you may have to walk the first time as you plot your strategy, but after that, run it at least several times a full-out dog-speed. It'll not only increase your fitness level, it'll also help you visual the course as it will run in real-time with your pup! What are your health and fitness goals for 2014? Leave a comment here and we can encourage each other, And you can also join the Resolve to Move Your Mutt Blog Hop, co-hosted by Slimdoggy and Keep the Tail Wagging, through January 4! Sounds like a very fit year ahead for you both. Have a fabulous Friday. I know you and Rocco will do great with your agility. Mom was going to do that with my little sister, but we decided nose work was more our thing. Have a wonderful fit 2014! I did nose work with Cosmo and he had lots of fun with it. Have fun! Love the idea of sprinting through the course. Why not try to navigate some of the obstacles as well? That would be an incredibly athletic and calorie burning workout for sure. PS- if you need a heavier hand weight, you can borrow Slimdoggy Jack. Or maybe one of Jen's Newfies! Thanks for the Slimdoggy offer! hehe! Two Rocco's -- one in each hand -- would actually be the perfect weight! The funny thing about navigating the obstacles is that you'll be disqualified in a competition run for the human taking an obstacle. That being said, I DO take the jumps while walking a course to figure out our strategy. Rocco looks beautiful and agile. We did agility when I was younger and would have loved to continue but the only agility trials, etc. in my area were on Saturday mornings and mom goes to synagogue. So we just went to park on other days. I can run off leash before 9 AM NYC parks. hehe! I think everyone breathes harder after an agility run -- than just running -- because of all the other elements involved... namely, keeping your dog under some sort of control and trying to remember the course at the same time! It looks like you will have a fun year ahead! Rocco looks so cute jumping. Can I ask you at what age you started agility training with him? We have a new pup and think he might do well at it when he's old enough (he loves to climb under and through things). We might just do it for fun, not necessarily competing, it's just something we're thinking about at this point. But I've always thought it looked fun. 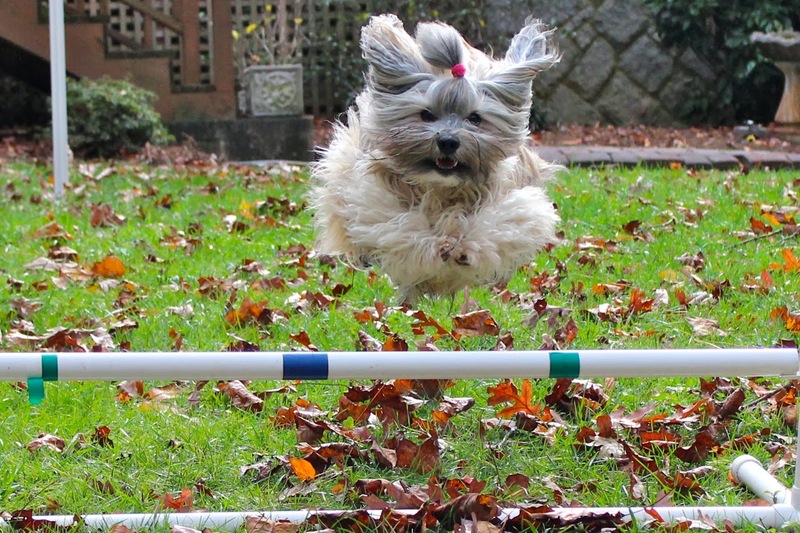 We know lots of folks who do agility for fun, and never compete. You can start a lot of foundation work at about six months, but your pup won't get on full-size obstacles until he's at least a year old. You can do puppy classes, beginner obedience, rally or puppy trick classes early on and all those will help to prepare for agility. You'll want to have some of the basics -- like sit, stay, down and a recall before you start agility classes. Let us know when you start! Great idea for getting me fit too! I need to space out Pierson's agility course a little more in order to force me to run. I'd rather walk several miles than run even an eighth of a mile. 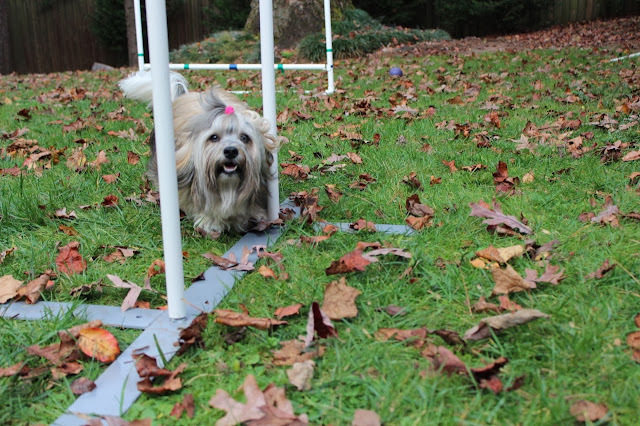 Agility always looks like a workout for dog & owner. I'm sure you'll easily get those NY resolutions happening!! Great photos of adorable Fit Dog Rocco- such a cutie. Love agility and good idea to run the course a few times for the extra workout. Happy 2014.